On a courageous Sunday afternoon I convinced my wife to put some pants on, brave the cold and drive ten minutes to our favorite Mexican restaurant Los Tres Chilitos for breakfast. As we approached the red light at Central Avenue. 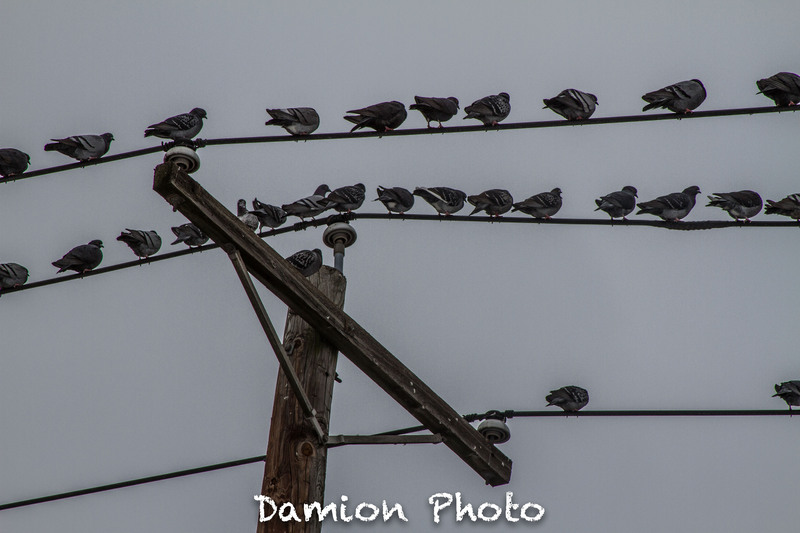 I spotted a gathering of pigeons on the telephone pole above us. Not having many opportunities lately to snap a worthy picture. I grabbed my camera and to my wife’s dismay, quickly evacuated the vehicle. After a few shots I managed to catch up to the car, find a parking spot and enjoy a delicious plate of rancheros huevos and authentic Mexican coffee. Not bad for another lazy Sunday. BTW, here’s my review of Los Tres Chilitos below. I highly recommend a visit. Previous Previous post: A Slight Change of Plans.